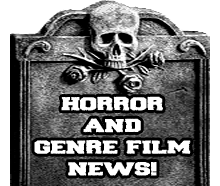 Review: In this review I will tell what I think of each Ernest film in this set but I won't go too far into that aspect, I will mainly focus on the quality of this blu-ray release. Anyways onto the review! 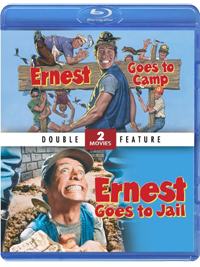 The first film in the set is Ernest Goes to Camp which follows our beloved Ernest P. Worrell as he goes from being Camp Kikakee's maintenance man to being a camp councilor for a bunk full of troubles kids. From the start of the film you get nothing but over the top humor and plenty of laughs to go with it and even some serious moments that help show that Ernest is not just some bumbling fool, instead you get a real sense that Ernest does care about the kids he is watching no matter how much they challenge him and on top of that his love for the camp. This is my personal favorite film in the Ernest series which could be my love for films about going to camp or even my nostalgic view of the film due to it being with me since childhood. Overall it's a great film that I think anyone with a pulse will enjoy. Now as far as the overall picture and sound quality of this film in the set I would have to give it a B+, now it does look good and all but just doesn't quite reach the level that I was expecting. If there would of been less film damage on the picture I would of easily gave it a higher rating. Oddly this film is 1080i instead of 1080p, which could be some reason why it's not quite as good as I was hoping for. The sound is decent, but nothing that we haven't really heard before if you own these films on DVD already, there is a 2.0 DTS HD soundtrack that does sound a bit better, but I would of preferred a 5.1 mix a bit more. The second film in the set is Ernest Goes To Jail and this time around we follow Ernest as he goes from his job as a janitor at a bank that he badly wants to be a teller at, to being behind bars because a death row criminal by the name of Felix Nash who looks like a slightly more rugged version of Ernest takes his identity while Ernest is doing jury duty. This is the 3th Ernest movie and certainly one of the best of the sequels that followed after Ernest Goes To Camp. This one like the others does have all the Ernest charm and over the top humor that will appeal to adult and children alike and like always does have it's serious moments to balance the film out nicely. There is alot of great moments in this film and for me one of the most memorable is when Ernest is trying to appear more tough and he does all these impersonations and also when he keeps trying to escape. Overall it's a good film that any fan of Ernest should see if they already haven't! Of the 2 films in this set I think this one fared more when it comes down to the picture quality. There seems to be alot less damage and just an overall better look. Now even though it does have a better picture it still may leave fans of the film wanting something just a bit better. Overall though I am satisfied with both films look on this blu-ray set. If you can get it for $10 or less I say go for it because it does beat the standard DVD hands down!